What should you know about sporadic colon cancer, a disease that affects far too many people even though it is frequently preventable? The term sporadic colon cancer simply means colon cancer that is sporadic — or spontaneous. This means that it is not related to the genetics of family history of the disease. The vast majority of colon cancer cases are sporadic colon cancer. Only 5% of yearly colon cancer cases in the United States are due to a "cancer gene". Another 20% of cases occur in people with a family history of the disease, but without a "cancer gene". This leaves approximately 75% of people who are diagnosed with colon cancer each year for no obvious reason. These are the sporadic colon cancer cases. Sporadic colon cancer is the 3rd most common cause of cancer deaths in men and the 3rd most common cause of cancer deaths in women. Even though 3 out of 4 colon cancer cases occur in people with no known genetic cause or family history, it doesn't mean that health experts have no idea what might contribute to who gets colon cancer. There may be no single, obvious cause to explain why a person gets colon cancer, but we do know that a variety of things, many of which are within our own control, do play a role in colon cancer risk. In addition to these three things, regular colon cancer screening is a must for reducing both the risk of colon cancer and the risk of dying of the disease if you are diagnosed. If you think you read that last sentence wrong, you didn't. Colon cancer screening has an advantage over screening tests for some other cancers in that it truly has a dual purpose: prevention and early detection. It can pick up cancers early (early detection) and save lives, and if can also prevent cancer in the first place if polyps that can become cancerous are detected and removed before they become cancer. If you need more reasons to sign up for colon cancer screening, consider that the five-year survival rate for people in whom colon cancer is detected in the earliest stages, when it is confined to the colon, is over 90%. 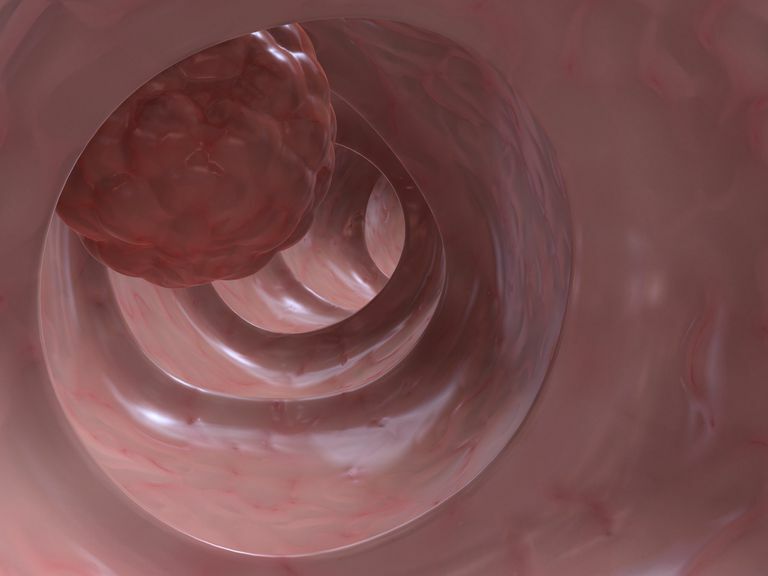 If cancer has spread beyond the colon to other distant areas in the body, five-year survival falls to an abysmal 9.8%. Screening greatly increases the odds that colon cancer will be caught early when it's curable. Already Diagnosed With Colon Cancer? It's Not Too Late! If you already have been diagnosed with sporadic, or any type of colon cancer, avoid the temptation to say, "I would have, could have, should have..." regarding what may have contributed to your disease. Self-blame is self-destructive and will do nothing to help you move forward in a positive way after your diagnosis. If you need more encouragement to avoid engaging in the self-blame game, consider that even after diagnosis, regular exercise and a healthy diet can reduce the risk of recurrence. Instead of wasting your time on things you can't change, like your past, focus on what you can do to help yourself fight your disease, starting today. Regular physical activity may reduce the risk of recurrence by up to 61%. Diet is important too and those diagnosed with colon cancer who eat a less-healthy, high-fat, low-fruit-and-vegetable diet have up to three times the risk of dying of colon cancer compared to cancer survivors eating a healthy diet. The bottom line? Regular exercise, eating right, and taking care of yourself can help us all, regardless of our current health status. National Cancer Institute. Colon Cancer Prevention – for health professionals (PDQ). Updated 02/11/16. National Cancer Institute. Colon Cancer Screening – for health professionals (PDQ). Updated 01/15/16.